Bamboo has been used for such a wide variety of tasks by indigenous peoples around the world. Even in modern society, it is said that over one third of the world uses bamboo in some form. In the country of Japan, bamboo is so engrained in the culture that the terminology for bamboo has expanded into conversation. Bamboo is not just a plant but a unspoken symbol of a Nation. 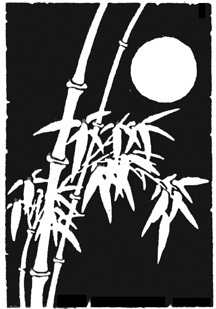 To the Shinto Priests of old, the hollow space in bamboo is where all the Spirits of nature live. Before Bamboo can be used for any lasting craft it must be cut and cured. Cutting is best in August or Winter, when the water and resins are down. Summer time will work as well for harvesting, but with a higher chance of cracks or splitting. Any cutting device will work for harvesting bamboo. A folding saw or a hefty knife are my favorites. If cutting with a knife, cut at a 45 degree angle with one swipe to prevent splitting or crushing the bamboo. At this point I would like to remind you to stop, take a minute, think about what it is you want to make. Look for the right piece, listen to the breeze though the grove. Find a area that removing a piece will be of benefit to the stand. And finally show respect and reverence, for it is not only a exceptional natural material, but the spirit of a people. The pieces are cut, the project is in mind and you are on your way. Now What?? The work begins. Seasoning bamboo is something of an enigma to most people. Personally, I have been working with bamboo and various methods of curing it for years, and still, I learn something new each harvest season. The key is to remove the moisture, natural starches and sugars without cracking the bamboo. This may be done with various success rates in the following manner, depending on your geographical area (I.E. temperature and relative humidity). The following are a few methods I have played with over the years. 1. SOAKING: A method commonly used in India is to soak bamboo for ninety days in water. Then set to dry in a sunny area for two weeks. I have tried this technique, but only with limited success, due to the extreme heat during Arizona summers. I have yet to try the same method during the winter season. 2. AIR DRYING: Cut the bamboo leaving the branches and leafs still attached. Store the bamboo upright in the sun for two weeks. Then continue drying in a cool dry place out of direct sunlight, cross your fingers and hope for the best. Depending on the area, watch for molding. 3. ABURANUKI: The Japanese method of drying used by the Shaku hachi or flute makers of Japan. The oils are removed from green bamboo by heating over a charcoal fire at aproximately 120 degrees C. Thereby, driving the resin to the surface which is then wiped off. The bamboo will change color to a lighter green or a yellowish tint. This method is tried and true. I have had very few pieces crack when using this technique, and no insect or mold problems. The bamboo is then set aside to dry for two more weeks. I would like to note that most Take Shokunin or Bamboo Craftsmen will set aside their bamboo for two to three years to cure out before using. My personal drying time is much faster. The reason . . . . well, simply put, "I live in a desert, not on a humid island." What to do now? Say we have a perfectly seasoned piece of bamboo and we are to set off on the adventure of creating your bamboo masterpiece. There are a few things you need to know about working bamboo. 1. Make a pre-cut with a sharp blade before any sawing. This will prevent fibers from splintering during the cutting process. 2. If you need to make holes in your project, you are much better off burning the holes through. The bamboo seems less likely to split during the drilling or later. Now that you have completed your bamboo masterpiece, what now? You will need to use some kind of finish for your project. The traditional heat and grease works well. Just lightly heat the piece over coals just until it's warm, then liberally apply oil, grease or fat to the piece. At no point should the bamboo become too hot to hold bare handed. Other methods include the use of modern sealers. Now, to stay primitive there is one excellent sealer I would use: natural shellac. You say, "What, shellac is primitive?" Well yes, used from the times of ancient Egypt . Shellac is nontoxic, food safe, water proof and will last for years. I currently use purchased shellac flakes dissolved in alcohol. If there is anyone out there that has more information on the primitive manufacturing or use of shellac, please send me the info.